This morning I summoned courage and walked to the nearby kiosk to confirm different remarks I had heard about the availability and affordability of cigarettes. Seller (Chuckling strangely): Which one? Me: Which ones you get? Seller: Okay I get Benson, N10, pack na N200. 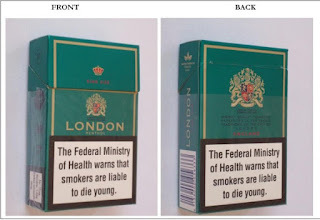 I also get London N10, pack na N200. All of them na same price. Me: You get empty pack wey you fit dash me? I have been getting different reactions as a result of the posts on tobacco and one particular reader reached out to inform me that many people are lured into the habit of smoking as a result of the extremely low cost of cigarettes and they remain stuck to the deadly lifestyle partly due to same reason. It was shocking to discover a stick of cigarette (N10) was cheaper than the cheapest loaf of bread (N50) and smallest sachet of milk (N15). I’m not sure if there’s any other vice that beats this rate, not even excessive alcohol consumption or prostitution. Nicotine – a substance that when mixed with water immediately functions as an insecticide. So, imagine car exhaust fumes, road tar and insecticide all together in one product being sold for N10 a stick (a stick that guarantees you will want more sticks). In a country where many struggle to eat well and access to life’s basic amenities is still a challenge, products with proven harmful effects like cigarettes should not be so easily available and affordable.